Last Monday, the 5th Golf Monthly Forum Golf Day in aid of Help for Heroes took place. This event has become a must play in the diary of the members of the forum and continues to grow and become bigger and better year after year. It started with forty members playing and raising £2,200 and then grew to fifty five players the following year which raised £6,500. It then went to Blackmoor Golf Club where eighty players attended and a significant £11,500 was donated. In 2013 the event really took off with a day at West Hill, a top 100 course where one hundred and eight golfers had a fantastic day and a massive £18,000 was raised. A magnificent effort and it just proves that from humble beginnings, it's possible to do great things. Of course it doesn't happen by accident and Richard Hart and Rick Garg, two stalwarts of the forum have worked tirelessly behind the scenes to make each and every event bigger and better. Of course this meant this years event at North Hants Golf Club had a lot to live up to. Situated in Fleet in Hampshire it's where Justin Rose learnt his golf as a youngster and is a marvellous heathland course. North Hants Golf Club was an ambitious project when it was opened in 1904 by Princess Alexander of Teck. It offered the ethos of a gentleman’s club to attract members from London and the atmosphere of an American Country Club with, in addition to a fine golf course, lawn tennis courts and croquet lawns of the highest quality. The Golf course was originally designed by James Braid, extensively redesigned in 1913 by Harry Colt and further improved in 1930 by Tom Simpson. More recently, three new holes were designed by Donald Steel in 2001 and a magnificent new clubhouse was opened in 2003. The Club has enjoyed a fascinating history which in many ways has mirrored the history of golf. A significant moment was the founding in 1957 of the Hampshire Hog which, as a leading event in the amateur golfing calendar, revealed the Club’s existence to a wider golfing audience. "These journeys of recovery will be cut short, unforgivably, if we as a nation unfix our attention. We must not let the wounded men and women of our Armed Forces down. This is therefore, I hope, as much a renewed pledge by all of us to go on supporting those who have sacrificed so much, as it is a celebration of an amazing achievement"
Just to get the heart racing, the course starts with a devilishly difficult 200 yard par three to a well bunkered green. A sweeping dog leg second hole from a raised tee provides another tricky par but this gives way to a much more comfortable and, for the low handicapper at least, a reachable par 5 third. This is a new hole, one of three designed by Donald Steel in 2001, and includes a spectacular approach over a lake to a raised and well contoured green. 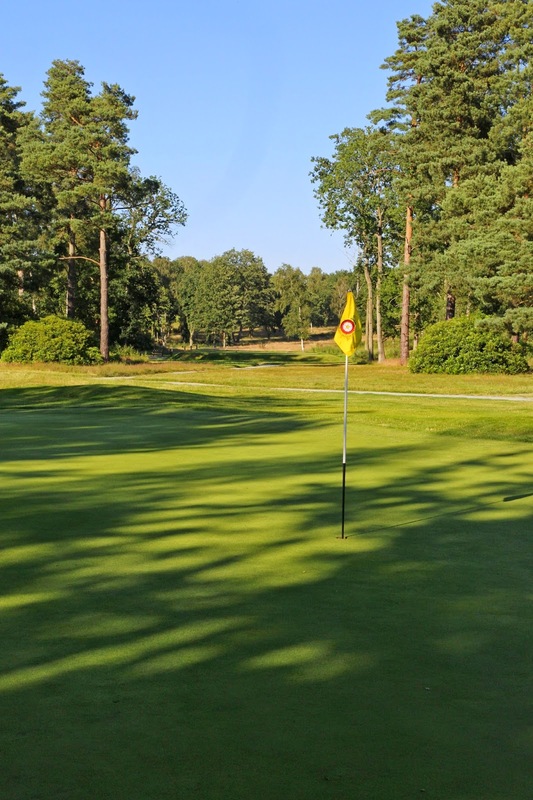 The rest of the front nine is classic heathland golfing fare, firm fairways giving way to well protected and fast greens. The short 8th is a classic par 3 which, though only 130 yards, requires a precise shot over a steep bunker to a narrow two tier green. When the pin is on the bottom, this is a true challenge. My day didn't start in auspicious fashion. With a hooked hybrid tee shot the ball scuttled way left into the trees. I had a restricted swing with a bunker to negotiate and could only move the ball forward short of the bunker. I pitched on and two putted for a double bogey five. My day didn't approve at the second. Again I was left off the tee but was unlucky that the ball pitched first bounce into a heather laden ditch prompting a penalty drop and another double bogey. The third is a glorious drive, blind over the brown of a hill and a second shot for the long hitters into this par five has to negotiate a large lake all the way to the putting surface. I took the safe route left onto the fairway and hit a good looking pitch from 77 yards which flew the green. I chipped well but failed to make par but at least I'd stopped the doubles. The remainder of my opening nine holes were a mixture of bogey and par golf. I wasn't playing bad golf and drove the ball reasonably. I was frustrated to hit the tough 422 yard 7th hole in regulation only to three putt from twenty five feet and more frustrated to end the nine with a double to dove tail my opening hole one. Having gone left off the tee at this dog leg I had to pitch back onto the fairway avoiding the line of bunkers but then hit a poor pitch trying to get too clever and coming up woefully short. A lame approach to the 18 feet and two putts. A messy end and I was in dire need of sustenance at the halfway hut. It's a wonderful place to stop and unwind and the sausage and onion bap was most welcome. The food must have worked as I found the green at the 10th. It's another par three to open to nine holes and I hit a solid hybrid to thirty feet and two putted with ease. My game continued to be a real mixture of good and bad. Although it was supposedly a charity day, there's always a desire to do well as there is no quarter given or asked on these forum days and the humour and mickey taking for any particularly poor shots is fierce but good natured. I made a hash of the hardest hole on the course, the 12th trying to be brave from the right hand semi rough taking a three wood from 226 yards. Not a great move as I carved it into the trees and it found a nasty lie in deep heather. I could barely move it forward and the club selection was probably wrong. I took a six iron as I had to keep it low but there wasn't enough loft to get it out of the heather. My next fared little better and by the time I reached the green and two putted it was a nasty triple and all momentum I hoped to build for a grand crescendo disappeared. In fact the stretch from the 12th to the 14th was a nightmare as I went triple, double, double but fought back to par the fearsome 15th although my tee shot barely scared the hole and it took two putts from 45 feet and a par putt from 10 feet to make the much needed par. I'd made net par at the 16th and 17th including a fine chip and putt at the par five penultimate hole. Having gone right off the tee I was back in perfect position and the wedge from 105 yards looked all over the flag but flew the green. It left a chip up and over a steep bank to a tight flag position and having got the ball to within 15 feet I rolled the par putt in. Sadly the closing hole towards an impressive back drop of the clubhouse behind the green didn't finish the round in style. My drive was right and took one large bounce into a huge rhododendron bush. I managed to find it but had to take a penalty drop. The tough closing drive. My ball found the bushes just visible on the right. Not what I'd intended!! In the end, my points tally was a disappointing 28 and good enough for 48th place out of some 87 golfers. Not what I'd hoped for but having never played the course before, there were some holes where club selection is vital and I'd definitely have played certain holes differently. Although I was never going to threaten the prize table, there is a rather unique trophy on offer to the winner which was donated by Sandy Catford from GoKart, the golf trolley manufacturer. It was given to her by Brian Slatter from tank manufacturer Vickers. In January and February 1991 Desert Storm took place to kick Saddam Hussain from Kuwait and Vickers had made and shipped nearly 200 Challenger tanks for the campaign. At the time, they were also making a "Mark 2" and one of the main features was it was designed to be almost invisible to enemy radar, "low signature" as it's called and these tanks featured a new and different paint job to make it harder to see. It's known as the "disruption pattern"
At the time, a lot of the officers had taken golf clubs out and needed a ball to show up in the white desert sand and so Vickers made 24 golf balls that were hand painted in the new disruption paint and shipped out to the officers. In the end Brian Slatter donated one of these balls to Sandy at GoKart and she thought it would make a fitting trophy for the Help For Heroes Day. The day wasn't done with the prizes to be given out and a fabulous charity auction with some marvellous lots to bid on. As well as vouchers to play some great courses like Wentworth and Royal Liverpool, in the company of Golf Monthly's editor Mike Harris, there was a chance to have a lesson with Mark Crossfield. He's created a niche for himself online with some great swing fix videos, hilarious course blogs from around the UK and abroad and some insightful product reviews. There was a chance to be Golf Monthly's Editor for a day and there was also a signed pair of golf shoes from Justin Rose which given the location seemed rather appropriate. On the day the total made was £15,000 but as always more money will always come in after that as donations continue to arrive and the successful bidders pay for their lots. I wouldn't be surprised if the final total doesn't beat the record last year at West Hill but whatever the final figure, it was still a fantastic day, wonderfully organised. I'd like to offer my thanks to all associated at North Hants Golf Club for their hospitality and the catering staff for their fine fare. I'd also like to thank all those from the forum who made the effort to play. It was great to see some old faces again and to meet up with some new members I'd only conversed with online. All that remains to be done I guess is get my game sharper next year so I can perhaps have a chance to have such a unique trophy in my possession for a year and to finding out where and when the next event will be. It will continue to grow bigger and better and hopefully raise more and more money towards an excellent cause.